Could you give me your thoughts on this approach to singing? It's centered on finding natural placement and not viewing the voice as divided into registers. This is said to be the superior method of singing. Franco Tenelli has many things he teaches that are very similar to Ken Tamplin's teachings, and yet they have areas that differ. Franco is teaching from a classical or operatic stylistic approach, and what is correct in his world may not apply in the modern singing techniques of KTVA. 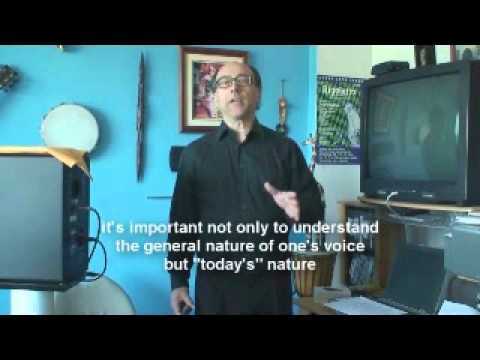 Ken does express learning to master the various registers of the voice so that the final result becomes ONE VOICE. This, however is a goal and a concept that is obtained by mastering each separate vocal register. There is little dispute that there is such a thing as chest voice, head voice, call register, mixed voice, falsetto, and even flageolet and vocal fry. That said, the art of singing is to master each of these regions and to extend and overlap each one so that one can maneuver smoothly and skillfully, from the lowest to the highest notes, with the sound of one voice. Mr. Tenelli has a limited vocal range when compared to Ken Tamplin, and his sound would be considered covered and darker as compared to Ken's. Franco has a more limited One Voice, and Ken has a much broader range One Voice. Franco has a lot of interesting videos on the web and he's out there telling it like he thinks it is. He's a knowledgeable guy. It comes down to: Who do you want to sing like? Do you want to sing like Franco, with his limited range, singing mostly arias? If so, then go for it and do what he says, exactly the way he tells you to. If on the other hand, you would like to have the range, power, and sound of Ken Tamplin, singing all forms of modern pop, rock, blues, belting, wailing, AND arias, then go for it, do exactly what Ken says, exactly the way he tells you to. Good singing to you, my brother! A good point tenelli is pointing out is the importance of your own kinestethinc awareness.